Tozer guides readers to accept the "faith that perturbs" - the genuine faith that leads to dissatisfaction with this temporary existence and prepares us for the life to come. 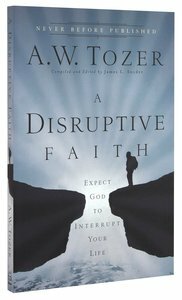 About "Disruptive Faith, A: Expect God to Interrupt Your Life (New Tozer Collection Series)"
:The word faith is common these days, but placing one's faith in God is a weighty action, uncommonly fraught with consequence and, by His design, inconvenience. Faith in God is reassuring and comforting only insofar as believers trust Him--and that depth of trust is the mark of a mature Christian who has allowed faith to intrude on his life and shift his gaze away from his own aims, needs, and desires. This is nothing if not a painful and disturbing process. A Disruptive Faith is A. W. Tozer's never-before-published teaching on what he termed "faith that perturbs"--faith that contradicts the unbelieving man and threatens the complacency of the Christian. The renowned pastor and teacher insists in these pages that genuine faith breeds dissatisfaction with this life, by God's design; it weans us from this temporary life and prepares us for the life to come. Readers will learn to be content with this faith-inspired discontent and to experience a fresh hope for eternity with God.